So I have been dropping hints and sneak peeks about this beautiful island on my social media for weeks. (If you’re not already following me on Instagram you can find all my sunny adventures over here!) 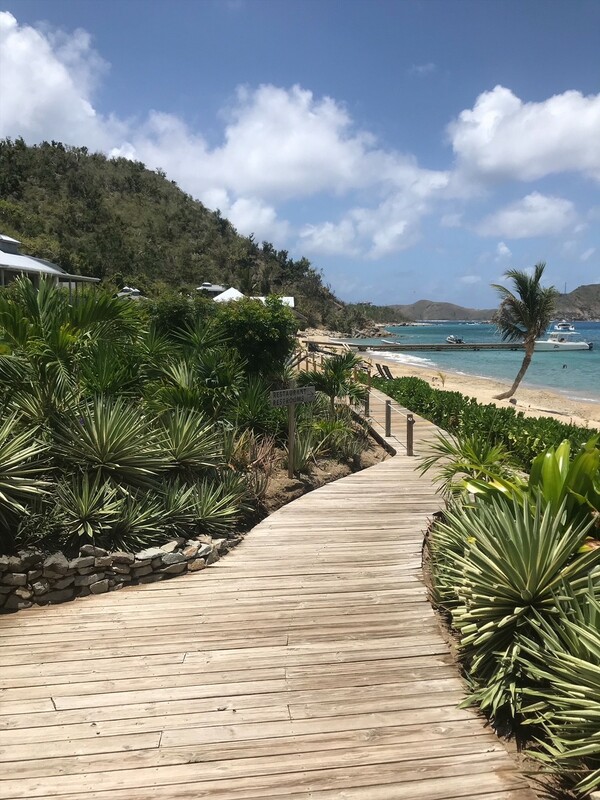 Ever since my visit to the re-opened Cooper Island Beach Club this very special eco-resort island location has been on my mind a lot! 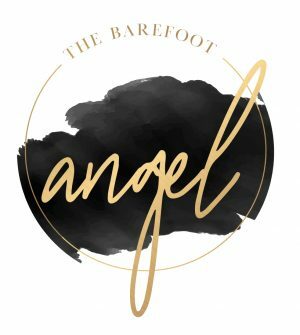 I knew that it was time to sit down, write a post and tell you a bit more! Eco-resorts and sustainable tourism are exciting travel concepts that are becoming more and more popular. As we all start thinking more consciously about the environment and we make changes to our lifestyle, we want those changes reflected in everything we do from the cruelty free make-up that we buy, the recycling we do and now the vacations that we take. Once seemingly exclusive to yoga retreats deep in the jungle, now more and more resorts are making the effort to go eco-friendly, and Cooper Island is the perfect example of what happens when luxury meets sustainable! 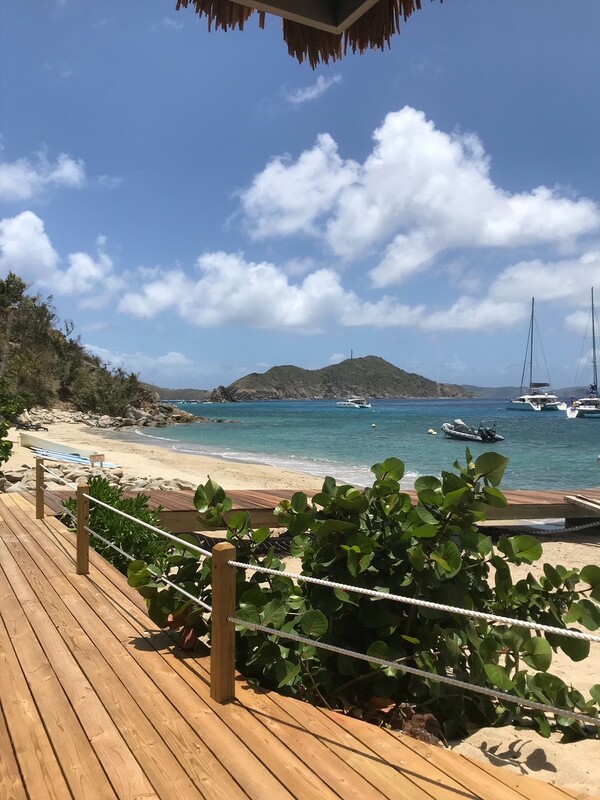 On the pristine white sand shores of Manchioneel Bay, Cooper Island in the beautiful British Virgin Islands, Cooper Island Beach Club is only accessible by boat. And I just so happened to find someone willing to take me over and explore. 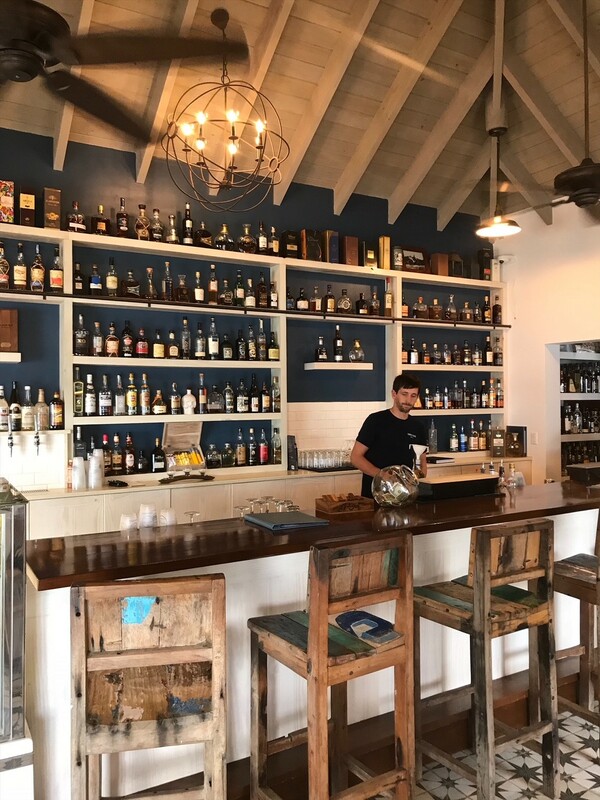 Comprised of a restaurant, a rum bar, a coffee shop, a gift shop, a micro-brewery and ten adorable beach front cottages. There is so much to explore on the property. It’s the perfect place to spend a few hours relaxing. So that’s exactly what we did – starting with a quick iced coffee at the Coffee Box! Once we were sufficiently fueled I really wanted to explore the gift shop. CIBC has a beautifully curated shop selling everything from rash guards to keepsakes, and it has a great selection of high-end ladies and gents resort-wear. I don’t often get a chance to shop in the BVI so an opportunity to browse some of the gorgeous clothes at CIBC could not be turned down! Next, with the sun most definitely over the yardarm it was time for a cheeky cocktail and a peruse of the lunch menu. 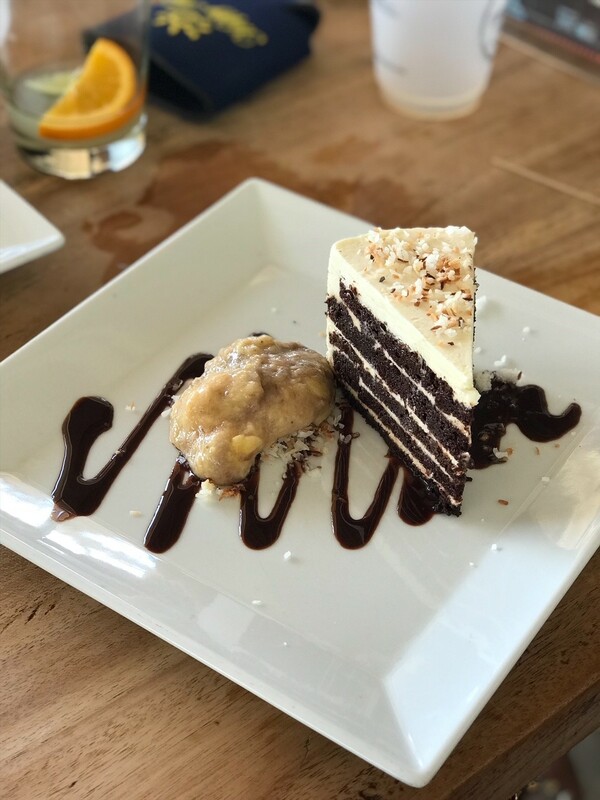 They were offering taco specials the day we went so the whole table ordered the same thing – but we made sure to save space for dessert! 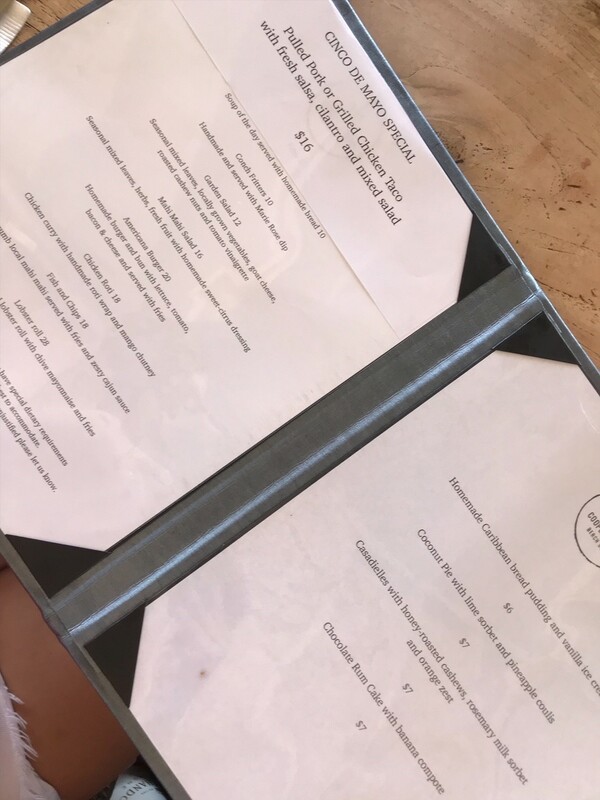 The lunch menu had some simple classics on there, salads, burgers, sandwiches and the like. 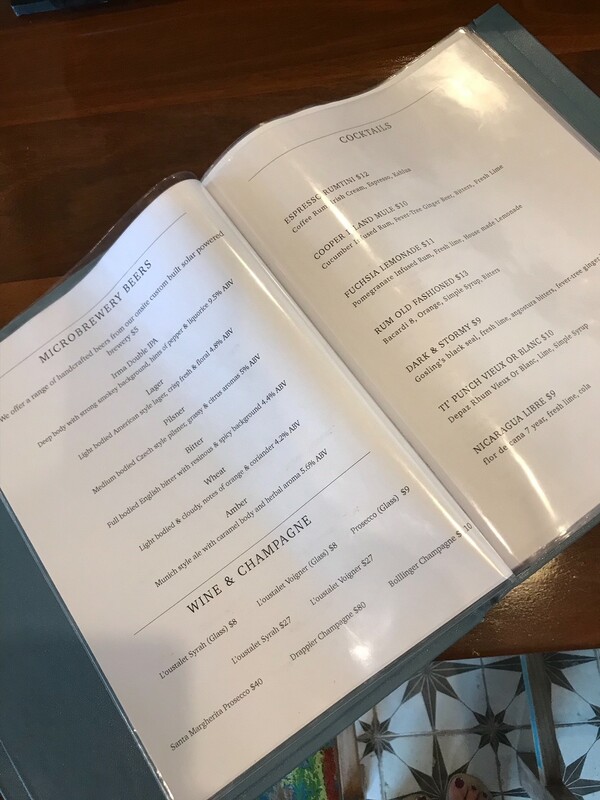 But the dinner menu on their website had me salivating, so I need to find a way to get back and sample it! 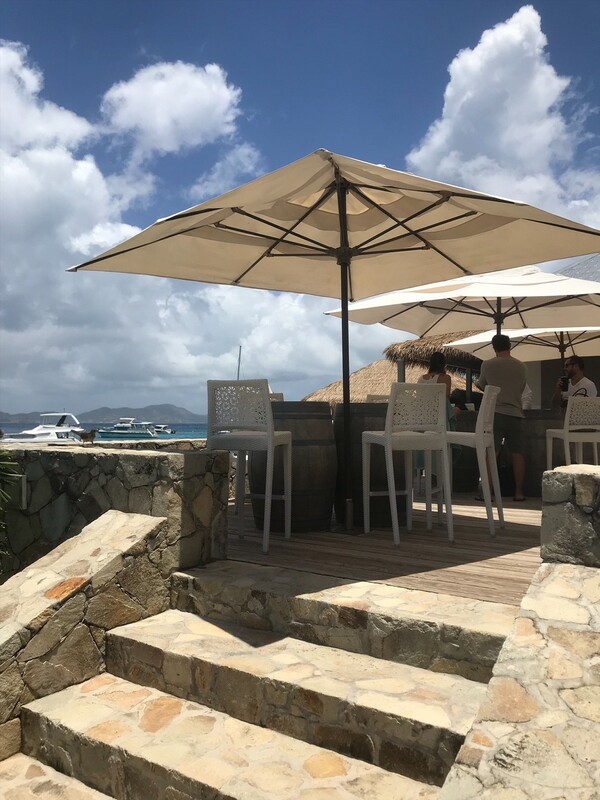 Just outside the restaurant area is the outdoor lounge, with comfy seating and huge parasol umbrellas providing the perfect shady spot to sit and take in the view. 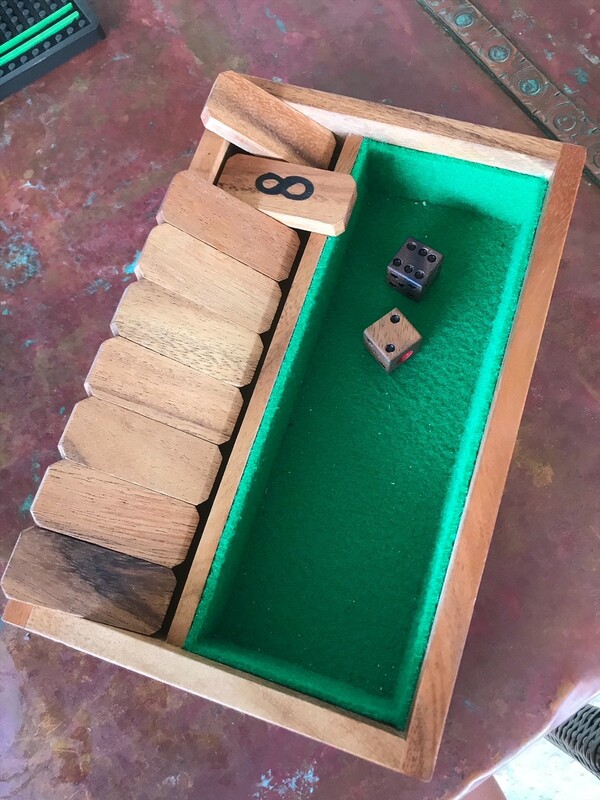 There are wooden games that you can borrow and you’re right on the beach should you feel like going for a paddle. I didn’t have time for that though – I was keen to find out more about their micro-brewery, so I headed back to the Coffee Box to find out more! Cooper Island Beach Club really makes an impressive effort to reduce their impact on the environment at every turn. Not content with producing all their own power and water, they decided to try their hand at making their own beers. Starting back in 2016 they launched their first three brews, a lager, an amber ale and best bitter. These were so successful that they added to the line in 2017 with a wheat beer, a pilsner and an IPA. Outside beers aren’t served at CIBC which helps to reduce the amount of waste that they produce. But you won’t miss them as the CIBC draft beers are delicious! 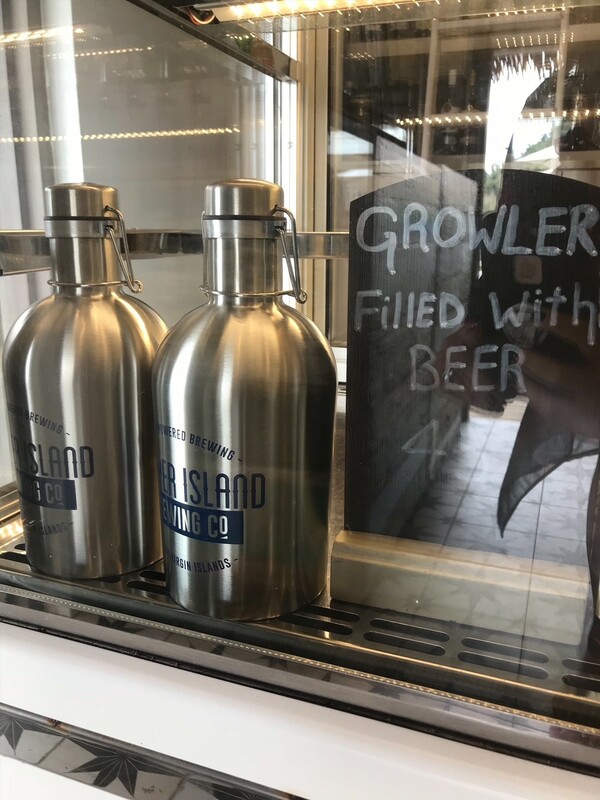 Drink them by the glass or buy yourself a full Growler for $45 and refill it for only $25. And speaking of waste, do you know what else you won’t find on Cooper Island? 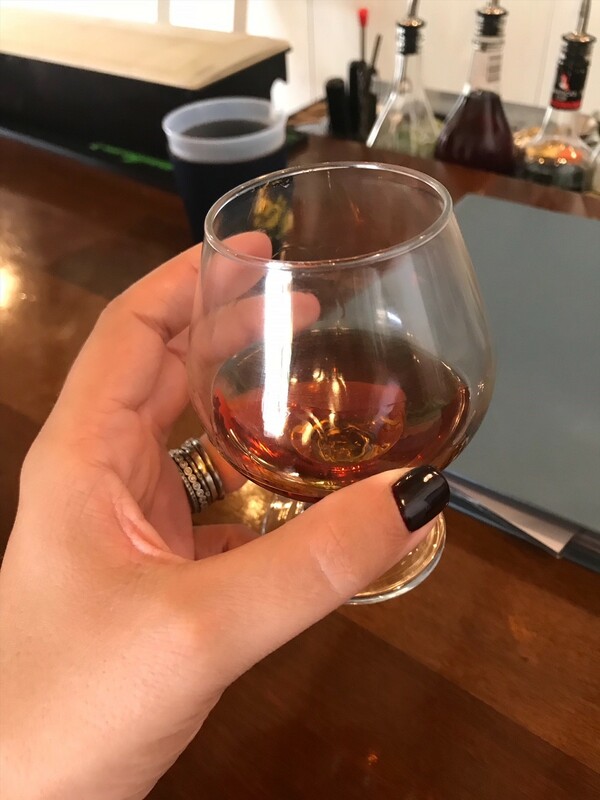 Single-use plastic… no plastic cups (only reusable ones) and none of those pesky plastic straws! 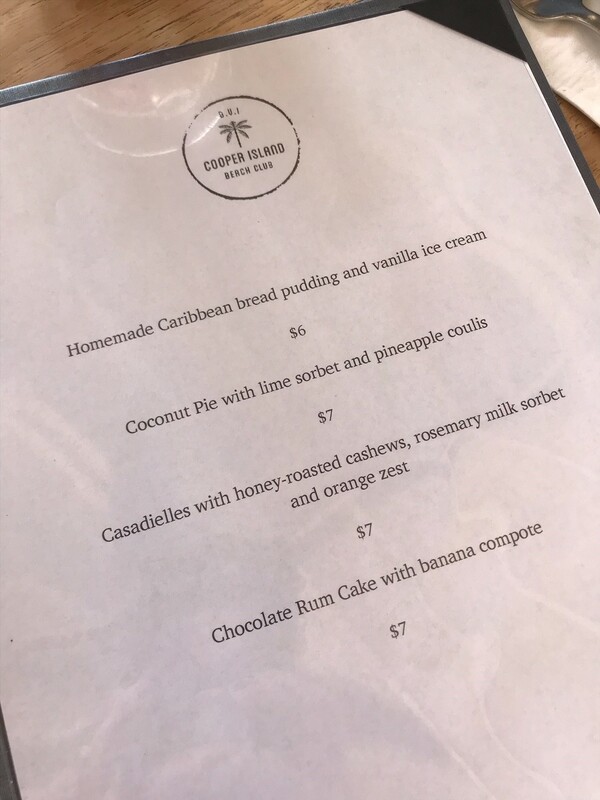 Bravo Cooper Island! The Cooper Island micro-brewery was custom built to be as power and water efficient as possible. Since all their power and water is produced on-island, this was key. For every 500L of beer produced only 570L of water is used and this includes the clean down process. For now the Cooper Island beers are only available at CIBC but I heard rumors that they may be coming to other bars soon, so we should watch this space. 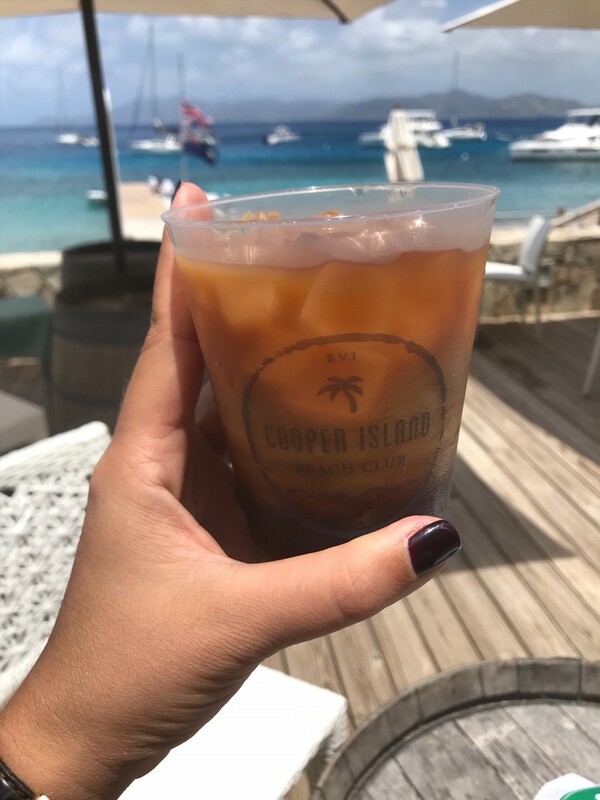 Cooper Island are committed to more than just saving energy though, $1 from every IPA sold is donated to BVI Sea Turtle conservation. Lastly before we left we just had to visit the Rum Bar (purely for scientific purposes, you understand!) 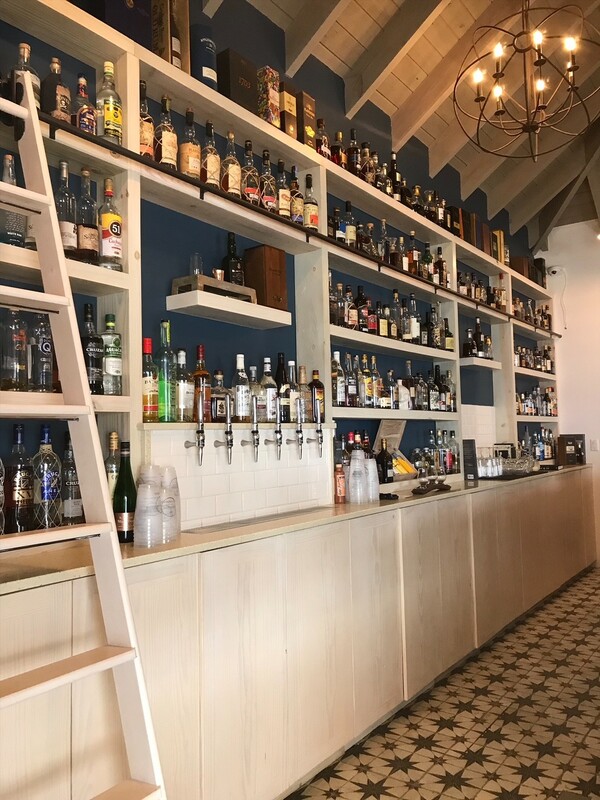 Cooper Island hosts different rums from all over the world, and has amassed quite the collection. 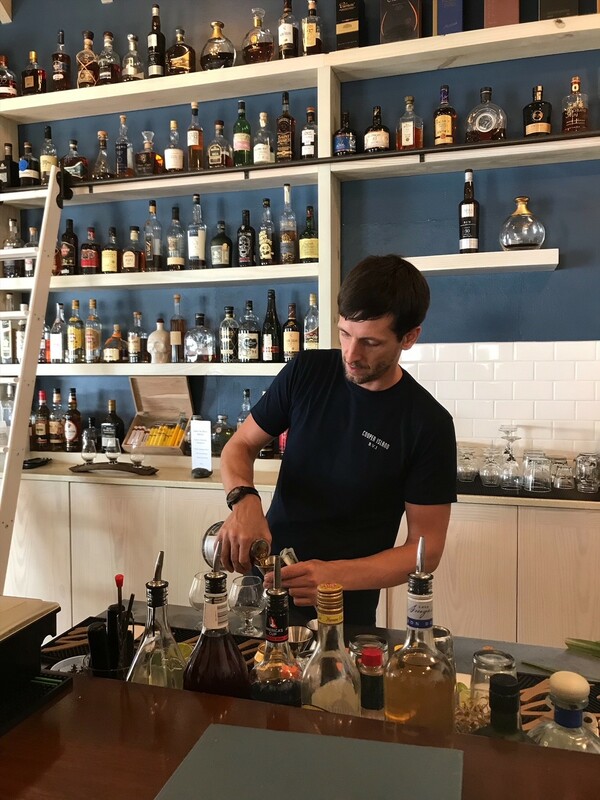 Our friendly bartender was more than happy to talk us through the selection and make recommendations, which was so helpful when there were so many to choose from! 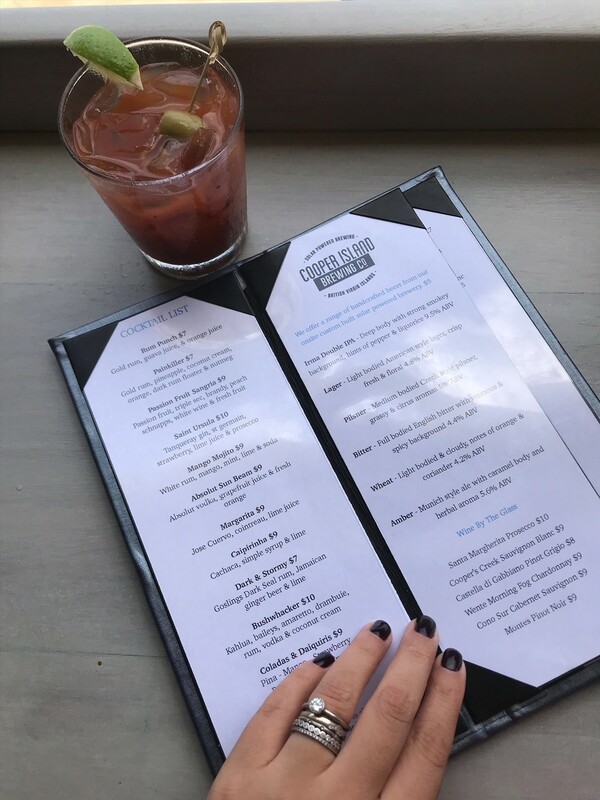 I really enjoyed the infusions that they make in-house, but everything we sampled was super tasty. Getting here: Cooper Island offers round-trip boat transfers for guests staying overnight in their rooms. 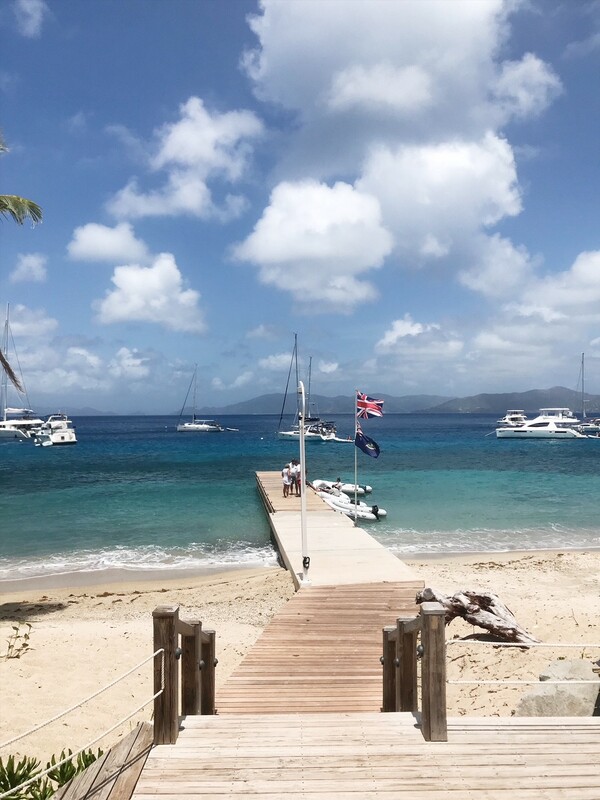 For those sailing over there are 30 mooring balls available in Manchioneel Bay which operate on a first-come, first-served basis and cannot be reserved in advance. 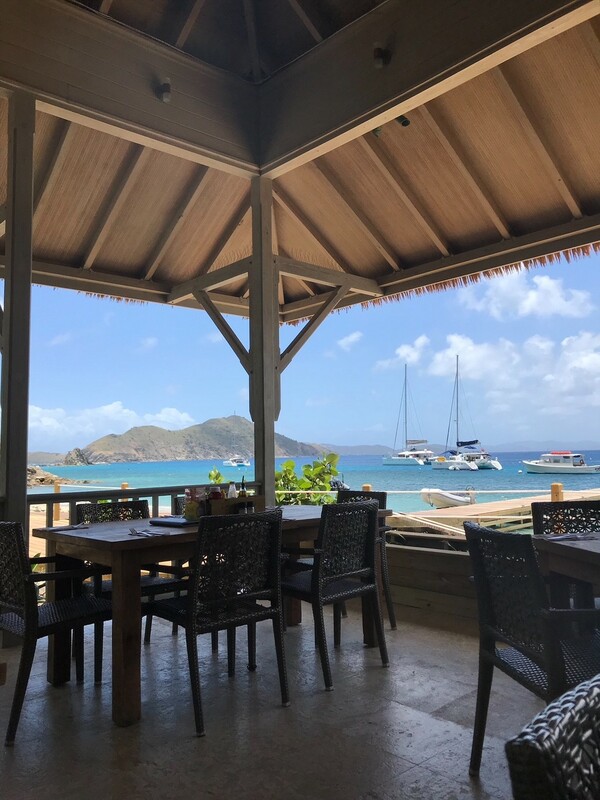 Lastly if you wish to come over for the day from one of the sister-islands, dive companies like Sail Caribbean Divers and Dive BVI sometimes offer day-trips from Tortola and Virgin Gorda, contact them to find out more. Tragically I have never stayed on Cooper Island past sunset which is something I plan on rectifying just as soon as I can! There is a spot in the lounge that is just waiting for me, where I can sit and watch the sun go down. The rooms look beautiful so I think a staycation might be in order! 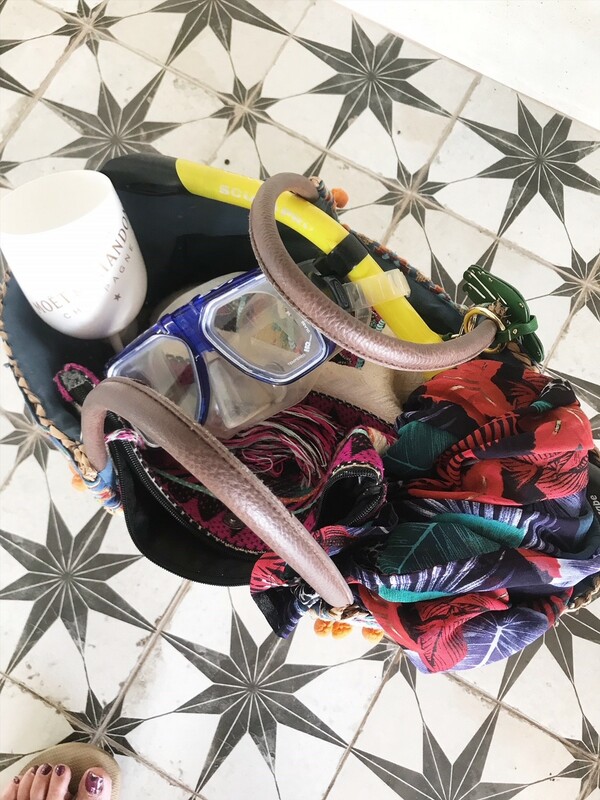 (Hint, hint husband…) Next time I might have to do a little more of the water-based activities available, like snorkeling Cistern point or a spot of diving with Sail Caribbean divers who provide dive tours from Cooper Island. 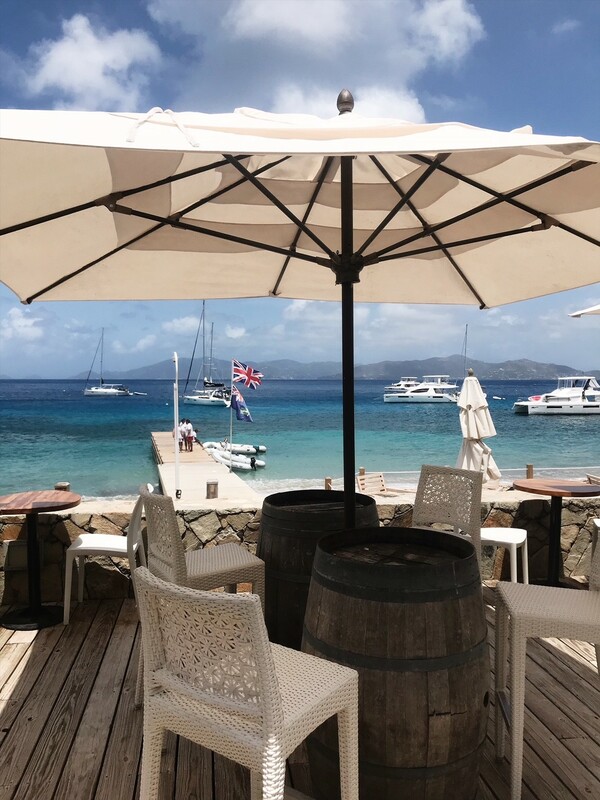 Find out more about where to eat, drink and stay in the BVI with my BVI restaurant guide here. You have no idea how much I’ve enjoyed reading this post about your trip. These photos are so beautifully taken and damn, that place is like a heaven on Earth. 🙂 Would love to visit one day! I love how this resort is eco friendly!! What a nice way to enjoy the sun sea and sand while being kind to the earth. I love the sustainable part of this! How cool that they are making those efforts! It looks like a dream vacation destination for sure!! that’s beautiful, especially for europe. If you’re going to southeast asia, then you can find many exotic island just like cooper island. Your post makes me want to book a vacation to a beach destination right away. Looks like you had a wonderful time at this resort. I really need to get there. Your photos look great and I love how unpopulated the beach looks. This place looks magical! Your beautiful photos have captured this wonderful island. And all these delicious plates and drinks, oh my! I love that they’re doing their part to eliminate single-use plastic. That would definitely encourage me to buy a drink from them (as if I needed an excuse to begin with, haha!). This place looks and sounds amazing, love that more places are trying to be eco-friendly! Wow, this looks like an awesome getaway! I would love a day at Cooper’s Island! 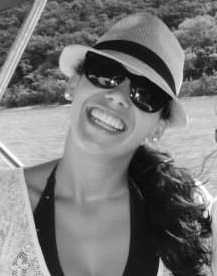 I enjoyed the ocean pics! The water’s color is gorgeous! I would love to visit a sweet little place like this. What a dream! I used to work at a zoo which preached sustainable eco tourism. This resort looks like the perfect place to practice it all! Cooper Island is beautiful! I like the scenery, including all the plants and waters there. I also like that this resort is really eco-friendly. A lot of times, resorts have lots of waste to contend with. 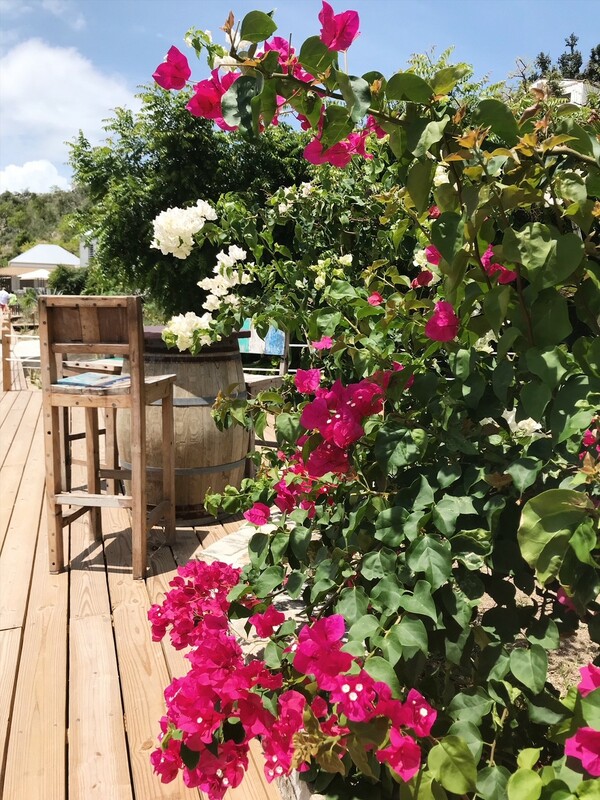 I like that eco-friendly resorts like this one make an effort to preserve the environment while still making their place a good experience for their guests. First of all, you photos are beautiful! But I love the idea of an eco-friendly beach and resort. It’s definitely a novelty that I would love to try. 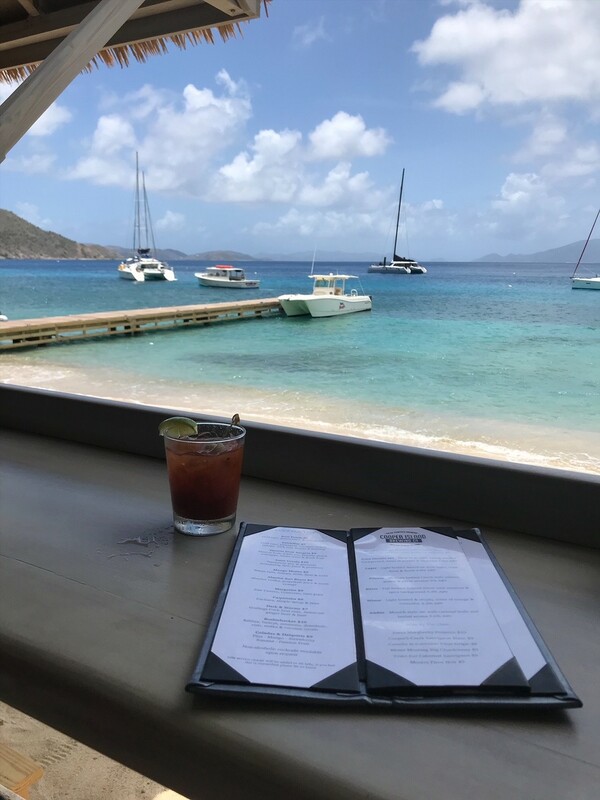 I’ve never been to the Virgin Islands so I would love to go and try this place out! And I can’t wait to get my hand on some of that homemade beer of their’s!!!! This is a beautiful eco-resort. 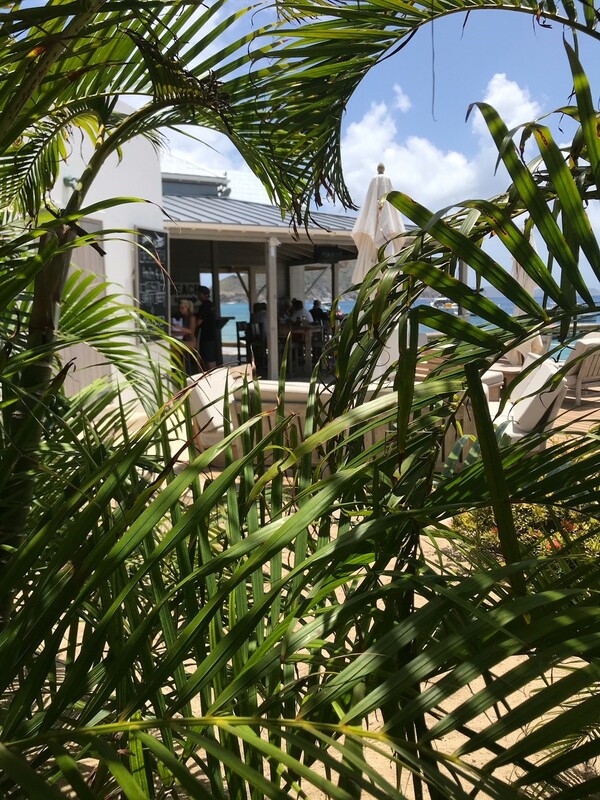 I hope more resorts will employ more sustainable ways in caring for the environment so many can enjoy the tropical paradise for a long, long time. WOW this is incredible! I had never heard of sustainable resorts! would love to check this island out! This is a great read! and the pictures are nice too! I’m going to share this information with my brides! Thanks to you this place is now on my list! WHy have I not heard of eco resorts? I love this. I am going to look more into this as this totally aligns with how we would love to travel as a family. Making the MOST impact in our memories with the least amount of footprint on the earth! I had no idea there were sustainable vacation spots! I bet that would be really cool to be a part of. That beach looks absolutely stunning! I appreciate the resort is eco friendly. That is the need of the hour and we must contribute to saving our environs. I am glad the resort is responsible. Oh my gosh the water looks so blue & the cocktail so yummy – I would love to visit there! I like how the resort is eco friendly and creates its own power and water. Excellent pictures. I wish I could be there. I really enjoyed reading about your trip! Beautiful pictures! I really love the way you travel. Even I am a responsible traveler and I prefer traveling without harming the environment. Thank you for this post, I am glad to meet travelers like you.